The dogs all love sweets, especially Chai! 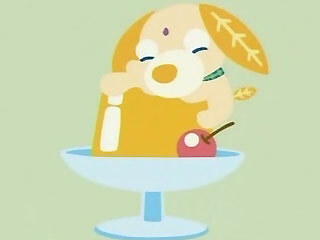 His favourite is mango pudding... pudding! pudding! pudding! Look! Pudding! 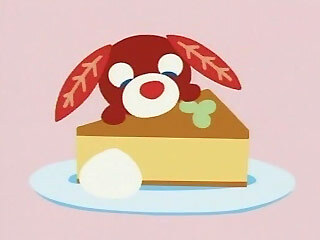 Chai runs over to the pudding.. ouch! He jumped onto Ryoku's tail in the rush for the pudding and woke him up. Poor Ryoku. 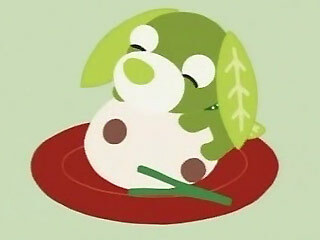 Chai jumps head first into the pudding and.. ah! He got himself stuck right in the middle of it! The other dogs are gathered around now and encourage him to get unstuck. Yay, he got out! Chai licks some of the pudding from his face... so, how did it taste? Ack, it was tofu.. not pudding at all! "When you see something you like, you head at it full speed. But before jumping at it, make sure of what it is."